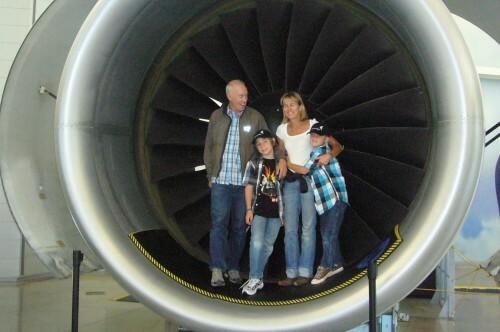 I had a chance to tag along with 8-year old Harry Winsor, his brother Charlie and their parents today on a VIP visit to the Future of Flight Aviation Center and the Boeing Factory Tour in Mukilteo,Wa. Harry and his family were getting the royal treatment in part to make up for the fact that, back in March, Boeing sent young Harry a terse form letter in response to his letter containing a picture of a jet airplane he’d designed. In the meantime, today Harry and Charlie got to see where their favorite airplanes get made. They got a bagful of cool Boeing airplane swag. And they got to to see their drawings exhibited alongside a few dozen other imaginative airplane drawings by children and adults from around the world in the Future of Flight’s Harry Winsor Design Your Own Aircraft Show . And, already a Well-Mannered Traveler, Harry didn’t come empty handed. He presented Boeing and the Future of Flight with a framed drawing he’d made especially for the occasion. I’ll post a gallery of some of the airplane artwork tomorrow, but in the meantime, see aerospace reporter Aubrey Cohen’s great photo gallery and article about Harry and Charlie’s day. Here’s a great lemons to lemonade story. 8 year old Harry Winsor really loves to draw airplanes. So his dad, a savvy advertising executive – with a blog – sent one of Harry’s pictures to the folks at Boeing. But rather than send Harry a thank-you note, the giant company sent Harry a form letter letting him know that – like every other idea or suggestion that comes in over the transom – they were legally required to shred the drawing; not even look at it – lest young Harry someday accuse the company of stealing his ideas. Other companies and organizations jumped in as well. Alaska Airlines sent Harry a model airplane. And now the Future of Flight Aviation Center – which is co-located with the Boeing Tour in Mukilteo, Wa. – has created a design your own aircraft show in Harry’s honor. Kids – of all ages – are invited to submit their airplane designs to The Harry Winsor Design Your Own Aircraft Show by June 7th, 2010. Designs will then be on display at the Future of Flight from June 15, 2010 through July 30, 2010. Everyone who enters will not only have their artwork put on display; they’ll receive a special badge for their efforts. Here’s what I’m sending in. It’s a drawing of the 787 Dreamliner I smuggled out of the factory during a tour organized by Alaska Airlines a few months back. Got something better? Then read the guidelines and send your drawing in to the Future of Flight’s Harry Winsor Design Your Own Aircraft Show.